Hang out with Bishop And Rook and all these fine bands May 29th. By our powers combined, we will create a totally stacked showcase and offer it to all music listeners 18 years of age and older! 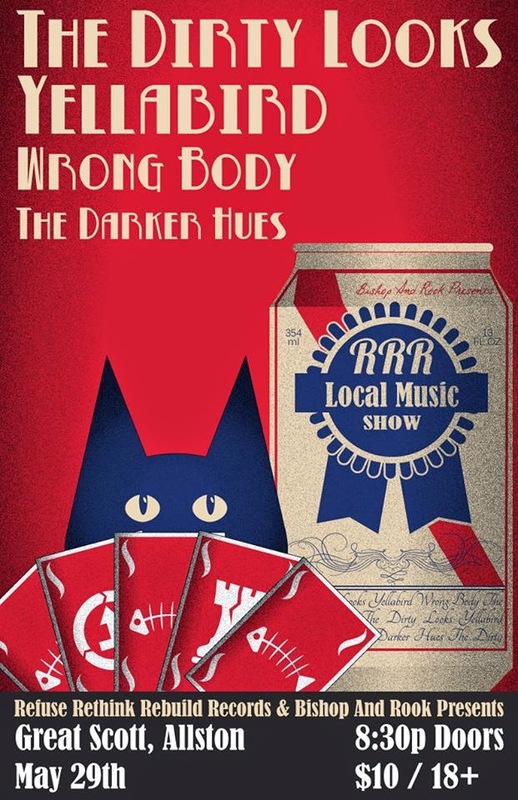 Bishop And Rook and Refuse Rethink Rebuild Records presents The Dirty Looks, Yellabird, Wrong Body and The Darker Hues at Great Scott in Allston on May 29th. Join the party with the now trending The Dirty Looks who just released their Line of Sight EP that ran out of downloads in 24 hours, recent 2014 Rock N Roll Rumble semi-finalists Yellabird, spring Allston Pudding Mixtape band Wrong Body and currently recording The Darker Hues. Get full event details at the official Facebook event page. Buy tickets now.